Expanded and renamed, the Stationary Fire Pumps and Standpipe Systems Handbook addresses NFPA 20 and NFPA 14 requirements for all types of fire pumps and standpipe systems. Order this practical resource for expert advice on helping to keep fire pumps and standpipe systems in compliance and functioning error-free! Developed by NFPA® and featuring commentary written by leading authorities in the field, the expanded Stationary Fire Pumps and Standpipe Systems Handbook is based on the 2019 edition of NFPA 20, Standard for the Installation of Stationary Pumps for Fire Protection, and the 2016 edition of NFPA 14, Standard for the Installation of Standpipe and Hose Systems. Access a wealth of information and support in a single source. The Handbook provides advanced guidance relating to all types of equipment, along with water supply availability and reliability. An exclusive Overview of Fire Pump Configurations includes examples of fire pump arrangements and explains the purpose of the components in each arrangement. The overview also features a full-color diagram that helps designers and engineers understand how multistage, multiport pumps can eliminate the need for pumps in series, potentially saving money. Part I includes the complete 2019 edition of NFPA 20, plus expert commentary. This edition introduces first-time sections on Pressure Control at the end of Chapter 4, General Requirements; Fire Pump Curve and Analysis at the end of Chapter 6, Centrifugal Pumps; and Electrical Power Supply for Fire Pumps in Chapter 9, Electric Drive for Pumps. Part II features the complete 2016 edition of NFPA 14, plus expert commentary. Design features make information more accessible. Just like in the standards, shading and change symbols tell you where a change has occurred. "Ask the AHJ" and FAQs help installers avoid common errors. Calculation Example feature is separate from commentary. "See More" feature includes pointers that help you navigate the Handbook. Summary of Technical Changes tables for NFPA 20 and NFPA 14 each provide a brief overview of major code changes from the previous edition to the current edition. 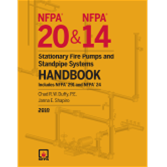 Interested in other editions of the NFPA 20 Handbook? Use the drop down menu above to select the edition year you need. Get the full story on how to keep fire pumps functioning error-free and in compliance. Based on the 2016 edition of NFPA 20, Standard for the Installation of Stationary Pumps for Fire Protection, NFPA®'s expanded and redesigned Stationary Fire Pumps Handbook provides advanced guidance relating to all types of equipment, along with water supply availability and reliability. Extracts with expert commentary from the 2013 NFPA 22, Water Tanks for Private Fire Protection, the 2014 NFPA 14, Installation of Standpipe and Hose Systems concerning standpipe water supply, and the 2016 NFPA 13, Installation of Sprinkler Systems.